Planning your next project? Chances are, you are spending much of your free-time combing through inspirational design blogs, analyzing digital paint swatches, and typing nearly every remodeling question that comes to mind into the all-knowing Google. There are so many resources available, but if you're just using your laptop or PC, you may be missing out on a lot of amazing apps that can help push you in the right direction with your remodeling goals. Check out our favorite tools (some are actually free) to help get you started. Benjamin Moore Color Capture puts paint palettes directly in your pocket. The paint color app takes the paper trail out of picking paint colors and allows you to save and share your favorite colors and palettes digitally to make paint buying a little easier - for you or your contractor. You can take photos of inspirational rooms and places using the app in order to pinpoint the best fit color by Benjamin Moore. 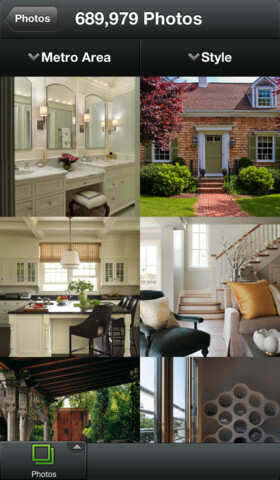 Houzz is the quintessential app for researching exterior and interior home decor and remodeling ideas. You can browse boundless photos of rooms and homes, using filters to whittle down the hundreds of thousands of images - by room and by style. By creating a username and password, you can save and store your favorite images in an Ideabook and upload your personal home renovation photos into an area of the Ideabook called “Projects”. Houzz even offers discussion forums where you can engage with both homeowners and designer alike to get advice on your next project. You can always go to houzz.com and access the same great features, but the Houzz app is especially intuitive and the high resolution design and decor photos are even more fun to flip through on an iPad. I.D. Wood helps you make sense of all the boundless types of wood available for your next project, from the basics of Balsa to the more complex Eucalyptus. Not only is I.D. Wood a general encyclopedia of a wide variety of wood species (yes, the app includes botanical names) but it also gives guidance on common uses for wood types (e.g. cabinetry, instruments, etc.) and how to optimize the use of certain woods. You can save your favorites and keep stock of your favorite wood samples as inspiration for your next cabinetry or hardwood flooring project. MagicPlan is a highly intelligent app that lets you take photos of the interior of your home and easily create a floor plan in minutes, whether you are mapping one room or your whole house. Once your floor plan is created, you can export the floor plan to a variety of computer friendly formats. Not only does this app provide a practical benefit, it’s also fun to use. Try it - it’s magic! 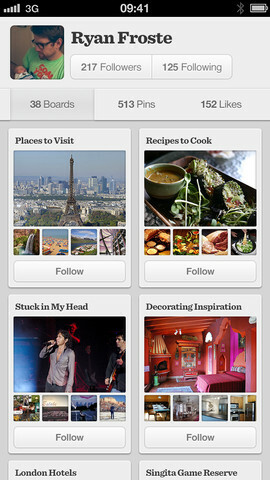 Pinterest is a tool that allows you to collect, store and share your favorite images from the web. Pinterest allows you to create collections of photos and save those photos to online pinboards, essentially digital bulletin boards. Pinterest is full of millions of images related to home decor - you can find these images and repin them using the app or you can pin images from your favorite home, design, architecture, and garden websites. We encourage you to sign-up for a Pinterest account now since there is a waiting list to get a login. Once you are approved, start pinning! Your pinboards are a great way to collage your favorite home ideas and get prepared for your next home remodeling project. The New England Cape is a popular style of home found abundantly in New Hampshire and Massachusetts, oftentimes characterized by a steep roof, gabled windows, and a simplistic exterior. Although the Cape has adapted architecturally to support modern day conveniences, many homes still retain some of the same characteristics as those first built many years ago. As a result, the Cape structure can pose some remodeling and design considerations for the modern household. Behold the power of paint. Use paint colors to your advantage. As a general rule, you should use lighter colors for small spaces and for the dormer, since dark or bright dormer paint can look eerie from the outside of your home at night. If the window creates a lot of light, make sure you opt for a flat or eggshell finish, rather than a satin or high-gloss finish. To make the room feel more open, keep the paint color consistent between the bathroom and the dormer. Optimize lighting with windows and fixtures. Take advantage of the light coming through the dormer window. If you have big plans for your bathroom, work with a contractor to discuss potentially expanding the size of the window to optimize the flow of light. If your budget is smaller, think about using window treatments to highlight the window and the light. Even if your bathroom gets a lot of natural light, small bathrooms with dormers generate many small shadows, so make sure your bathroom lighting fixtures are bright enough to flood light throughout the bathroom. Soft light can make the room feel smaller. Use mirrors to help create reflections of light which will brighten the room even more. Be deliberate with your design choices. There are some great options for optimizing a small, dormered bathroom. You can use the dormer to encapsulate your shower or tub and find great fixtures and materials to meet the demands of the space. For example, if your shower is under the dormer and features slanted walls, you can find a special shower head fixture to best suit the space. Also, opt for a glass shower door and enclosure to keep the room open (standard shower curtains add too much weight to the room and can make it feel smaller). You can also opt to use the space under the dormer for your tub. 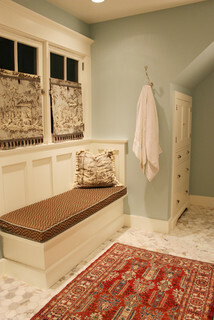 Claw foot tubs work great in small nooks and can help create a cozy space to take a bath. This approach also preserves precious space in the remaining bathroom. Install a built-in below the dormer. Depending on your space and budget, you may not be able to find a useful function for the area under the dormer. Rather than struggle with your design plans, consider optimizing the space below the dormer by installing built-in storage. You can create built-in shelves to hold bathroom supplies like towels, soap and toilet paper. Built-in cabinets take a bit more work, but can create a nice storage solution, as well as creating interest as you can decorate the natural shelf on top of the drawers.